Earlier today, I posted a pic of my daughter's first essay. It's about her experience going to the Zoo. I asked her to write what she saw, what she did and with whom did she go there. Apparently she only wrote about the animals that she saw there, PLUS she wrote it in English & some Malay. Hahahah. She switches code and that's normal for a bilingual kid like her (but she's a trilingual in the making actually). Wait, is it normal? Because I only know that code-switching is normal in verbal conversations, what about in writing? It's okay, it's a learning process anyway. I am actually trying to teach my daughter to write. I wanna raise her as a good writer. No, not a writer as a job for sure. But I want her to be good in telling/sharing stories, as well as expressing what she feels. I always feel that kids who are good in writing, somehow are well mannered and matured earlier than other kids in the same age but not used to writing. Do you know Mukhtar, the writer from Pawsome Lion blog? He's a young blogger. If I am not mistaken, he's 11. And he's incredibly well mannered, matured and a good brother to his little siblings. (And I think it has something to do with his writing passion.) Everybody says so, you can follow his family's instagram: @thefamily.uk. They are Malaysians living abroad. Adorable family mashaAllah. Okay back to the reason why I want my daughter to be good in writing in her early age. For me when someone writes, they need to think and ponder a lot. And in my honest opinion, a good writer is also a good observer. 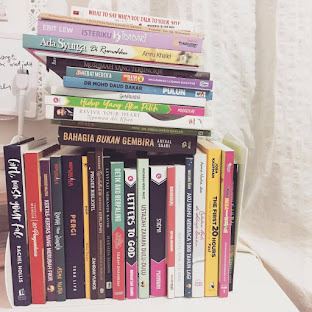 We don't really have to read too many books in order to start to be a good writer, instead, we need to observe a lot, have ample of life experiences, besides practicing to write and write and write. Writing based on our own experiences will be much more from the heart and helps a lot to write better. However, of course I don't deny the importance of reading a lot to be able to become a good writer. One of my ways to increase my daughter's interest towards writing is; to buy her a book specially for her to write about anything. Oh can't wait for it! It's already Maghrib here, so, see you soon!